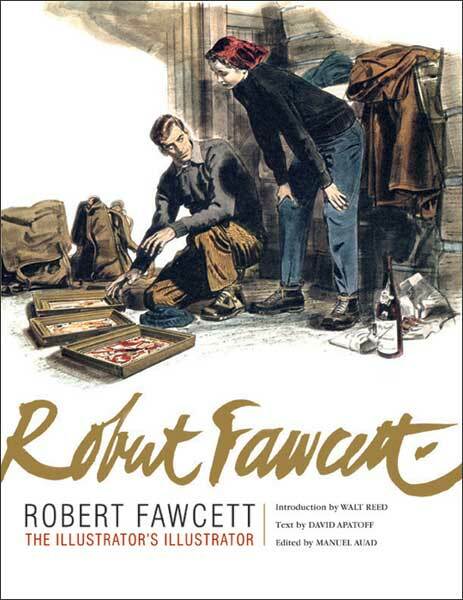 Illustration fans everywhere have impatiently waited for a book on the legendary Robert Fawcett, known as “The Illustrator’s Illustrator.” At last their dream is about to come true. The first book on the life and work of Fawcett is under development by Auad Publishing, scheduled for release in early spring 2010. Walt Reed, who knew Fawcett personally, has written an insightful introduction and David Apatoff, a foremost authority on Fawcett, has contributed the text. The book will contain over a hundred color illustrations and numerous black and white drawings. These are images which have long been out of circulation and are largely unavailable today. Many of the images in the book were made from the originals which have been hidden away for decades by private collectors so the quality will be superior to the images published in magazines many decades ago. Best of all, the 12 Fawcett Sherlock Holmes illustrations will be together in a book for the first time, some taken from the original paintings. A great deal of passion has been devoted to this project. Everyone who is familiar with Fawcett’s work will surely want a copy, and those who are unfamiliar with his work will enjoy seeing what they have been missing. Stay tuned to this website as we bring you the latest on the progress of this marvelous book. Robert Fawcett – A Set on Flickr – compiled by Leif Peng, whose blog, Today’s Inspiration, you need to bookmark right now!